U.S. stocks closed a choppy session little changed Monday, as investors took a cautious approach at the start of a big week for Corporate America. 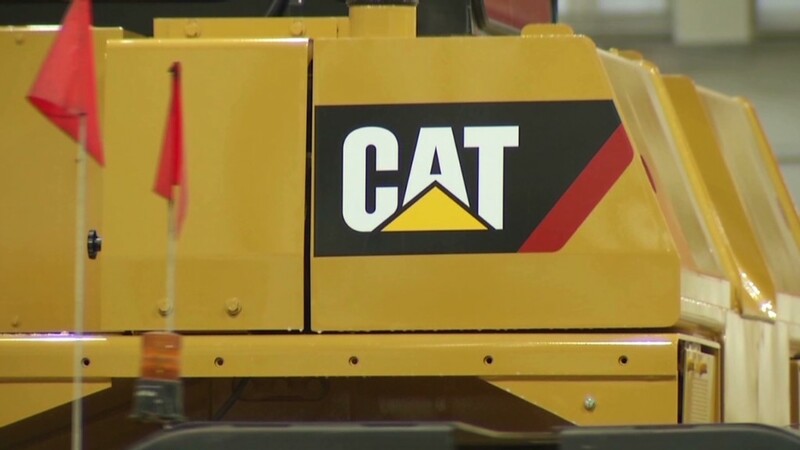 Global bellwether Caterpillar (CAT) kicked off the week's earnings deluge with a disappointing outlook, even as its quarterly results came in better than expected, citing continued economic weakness and uncertainty. "We are taking a pragmatic view of 2013 -- we're not expecting rapid growth, and we're not predicting a global recession," said Caterpillar CEO Doug Oberhelman in a statement. After a weak open, Caterpillar held on to a solid gain, making it among the best performers on the Dow Jones Industrial Average. But General Electric (GE) and Microsoft (MSFT), which reported lackluster earnings last week, continued to drag on the blue-chip index. The Dow closed up just 2 points. The S&P 500 finished less than 1 point higher, as a 4% decline in shares of VF Corp (VFC), the maker of North Face jackets and Wrangler jeans, weighed on the index. The company, which is also behind brands like Seven for all Mankind and Vans, posted revenue that missed expectations. 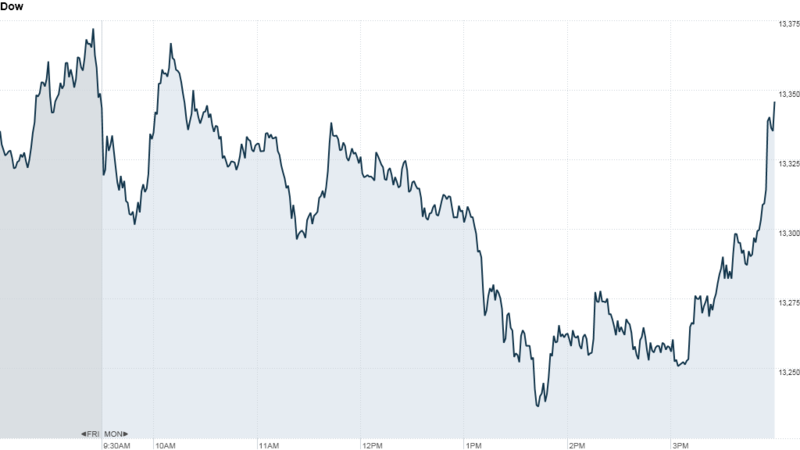 A 14% drop in shares of Monster Beverage (MNST) added to pressure on the benchmark index. Monster's stock took a tumble after the New York Times first reported that five people may have died in recent years after drinking the company's popular energy drink, citing reports recently released by the Food and Drug Administration. The Nasdaq rose 0.4%, as gains in Netflix (NFLX) helped buoy the tech-heavy index. The online streaming service opens its books later this week, as do fellow tech heavyweights Facebook (FB), Apple (AAPL) and AT&T (T). Shares of Apple were also sharply higher, as the company is widely expected to introduce a smaller version of the iPad, dubbed the "iPad mini" at event in San Jose Tuesday. But first Yahoo (YHOO), with new CEO Marissa Mayer at the helm, took the spotlight as it reported results after the bell Monday. Yahoo's third-quarter earnings rose 66% over the year, and handily beat estimates. Excluding a percentage of sales that Yahoo shares with partners, revenue came in at $1.09 billion, just above forecasts. Shares of Yahoo rose nearly 3% in after-hours trading. Meanwhile, shares of DISH Network (DISH) rose after the company reached an agreement with Voom HD Holdings, which owns Cablevision and AMC Networks, on Sunday. DISH agreed to pay $700 million in cash to settle a dispute over wireless multichannel video distribution and data service licenses. BP (BP) shares fell after the oil giant said Monday it was in "advanced discussions" on a deal that would result in the sale of 50% of its Russia-based assets to Rosneft, a state-owned oil and gas company. Ancestry.com (ACOM) shares surged after the genealogy website announced plans to be taken over by an investor group led by private equity firm Permira. The cash transaction values Ancestry.com at $1.6 billion, or $32 per share. Halcón Resources (HK) shares jumped after the company announced a $1.4 billion deal with Petro-Hunt to develop a stake in North Dakota's gas-rich Bakken and Three Forks region. World Markets: European stocks closed lower. Britain's FTSE 100 fell 0.2%, the DAX in Germany slipped 0.7%, and France's CAC 40 lost 0.6%. Asian markets closed higher. The Shanghai Composite rose 0.2%, the Hang Seng in Hong Kong advanced 0.7%, and Japan's Nikkei gained 0.1%. Currencies and commodities: The dollar fell against the euro and the British pound, but edged higher against the Japanese yen. Oil for December delivery fell $1.79 to settle at $88.65 a barrel. Gold futures for December delivery gained $2.30 to $1,726.30 an ounce. Bonds: The price on the benchmark 10-year U.S. Treasury edged lower, pushing the yield up to 1.82% from 1.77% late Friday.